Guyana Defence Force (GDF) Recruitment and Retention personnel yesterday began a three-day exercise with experts of the Florida Army National Guard (FNG) on best practices. A release from the GDF said that the objective of the activity is to identify key issues that serve as obstacles to Recruitment and Retention. 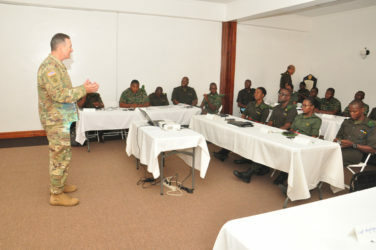 FNG Deputy Commander of Recruitment and Retention, Major Peter Jennison is heading the delegation and at yesterday’s introductory session said that his team will also benefit during the exchange and will also share their practices in the effort to recruit the best people, retain them and keep them wanting to come to work each day. Adjutant General, Colonel Nazrul Hussain of the GDF, during brief remarks at the start of the sessions, welcomed the FNG team and acknowledged the challenges that sometimes come with Recruitment and Retention. The release said that the sessions are also meant to examine recruitment strategies, concerns and necessities, maintaining morale, keeping the workforce engaged and commitment to the Force.